The launch on Thursday -- the North's fifth weapons test in a month -- was overseen by leader Kim Jong-Un, the State-run Korean Central News Agency reported, and came less than a week after the United Nations tightened sanctions against the Stalinist regime. People watch a TV broadcast of a news report on North Korea missile firing. Seoul, South Korea: Pyongyang on Friday hailed the successful test of a new type of surface-to-ship cruise missile, which it said was designed to hit "any enemy group of battleships" that threatened North Korea. "The launched cruise rockets accurately detected and hit the floating targets on the East Sea of Korea," KCNA said, referring to the Sea of Japan -- where two US aircraft carriers were carrying out naval manoeuvres last week. The USS Carl Vinson and the USS Ronald Reagan led the three-day exercises that ended June 3, with a total of a dozen US ships participating along with two Japanese vessels, in a show of force directed at North Korea. The US has stepped up its muscle-flexing in the region, with a US nuclear submarine, the 6,900-ton USS Cheyenne, whose home port is Pearl Harbor, also arriving in the South Korean port of Busan Tuesday. North Korea has ordered three ballistic missile launches, a surface-to-air missile, and now Thursday's cruise missile tests since South Korea's new President Moon Jae-in took power in early May. Thursday's short range missiles flew some 200 kilometres (124 miles) which is an improvement on a 2015 test, when a North Korean surface-to-ship cruise missile flew only 100 kilometres, said Korea Defence Forum analyst Shin Jong-Woo. "This is another sign of meaningful progress in the North's efforts to diversify its missiles. It will pose a considerable threat to US and South Korean navies," he told AFP. KCNA said that the weapon tested Thursday had been part of the military parade in Pyongyang on April 15 to mark the birthday of the North's founding father Kim Il-Sung. All of the weapons on display at the extravagant military parade have been tested in the last month, except for one which analysts said appeared to be an intercontinental ballistic missile, Yonhap news agency reported. Moon advocated reconciliation with Seoul's isolated, unpredictable neighbour but has taken a more stern position in the wake of the missile tests, which pose a policy challenge to the left-leaning leader. The launches come less than a week after the United Nations expanded sanctions against Kim Jong-Un's regime in response to the string of recent ballistic missile tests. Diplomats at the United Nations denounced Thursday's cruise missile launches as another provocation by North Korea, though no immediate meeting of the Security Council is planned. 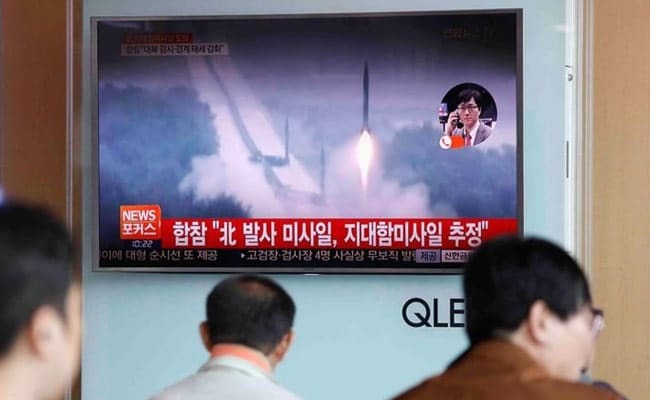 Cruise missile tests do not contravene UN regulations, Korea Defence Network analyst Lee Il-Woo told AFP, adding they were "much slower than ballistic missiles and can be shot down by anti-aircraft guns". However, the European Union on Thursday broadened its sanctions against North Korea over its work on nuclear weapons and ballistic missiles. The EU said it would freeze the assets of 14 more people and ban their travel to Europe in line with a UN Security Council resolution last week for more sanctions over Pyongyang's ballistic missile tests. The North has carried out two atomic tests and dozens of missile launches since the beginning of last year in its quest to develop a missile capable of delivering a nuclear warhead to the continental United States -- something President Trump has vowed "won't happen".